When you dream about studying abroad, do you imagine a colorful commute home every day? Do you hope to fill time between classes soaking up the local art scene? 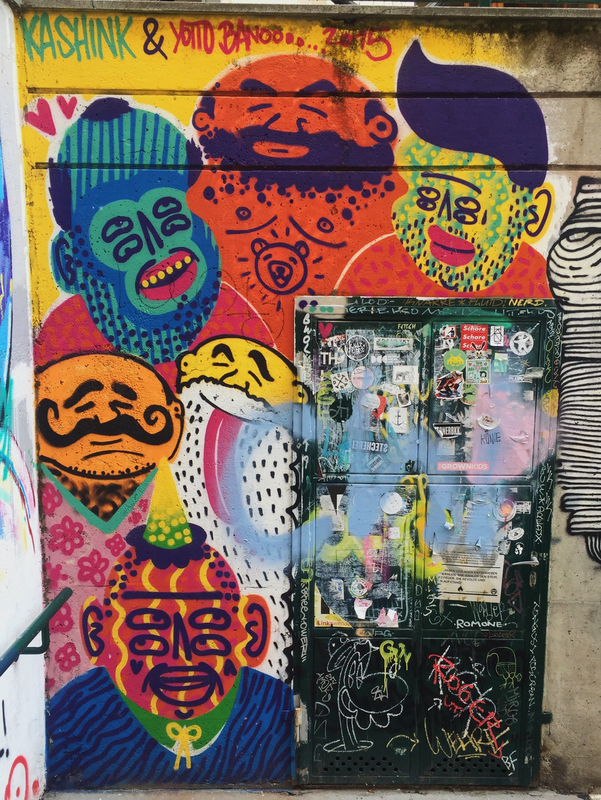 From neighborhood graffiti tours when you study abroad in Buenos Aires to street art festivals when you intern abroad in Hong Kong, look no farther than these 11 top locations to discover world-class street art. Named the “City of Design” by UNESCO, Berlin has a thriving artistic subculture that includes a graffiti magazine, alternative art tours, and the first-ever street art museum – The Urban Nation Museum for Urban Contemporary Art. When you finish taking in the preserved art in the museum, head over to Haus Schwarzenburg Street Art Alley to find something new every week as images are regularly painted over and added to. Who knows? You could catch a painting by famous street artists El Bocho, Miss Van, Stinkfish, or Otto Schade, who have all left their mark on the Alley before. 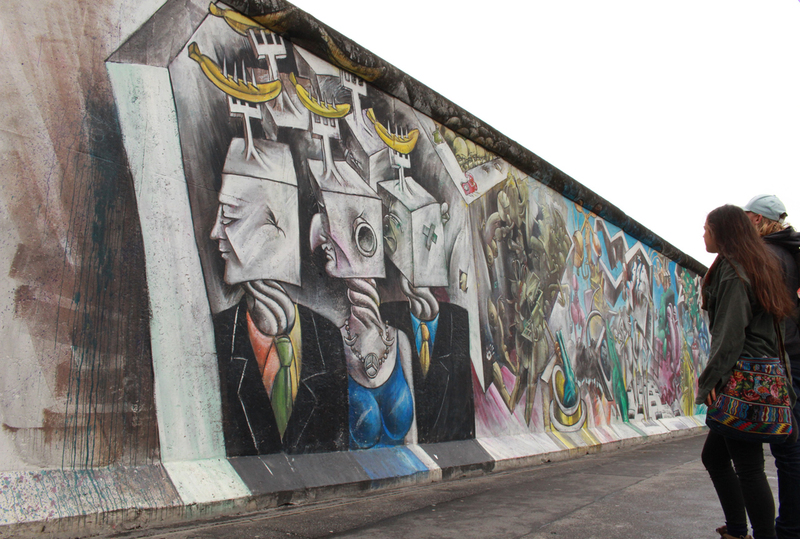 When you study abroad in Berlin with IES Abroad, you can dive even deeper into urban art through our Visual Culture and the Urban Landscape course, which include a tour of the East Side Gallery – the historic street art left on the Berlin Wall. The abundance of blank walls and zero municipal restrictions on painting them (as long as artists receive consent of the property owner! 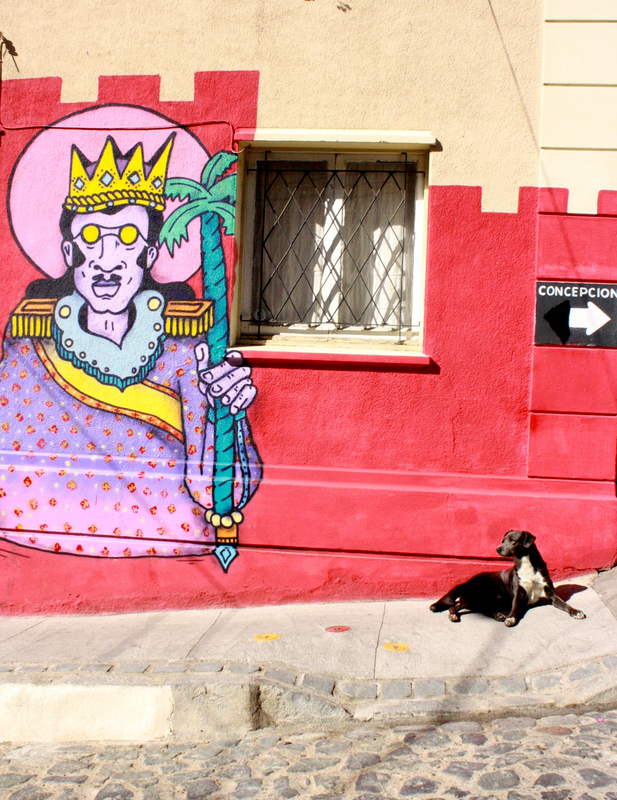 ), street artists find Buenos Aires a welcoming canvas for their art. Famous artists such as Blu, Martin Ron, and Finatan Magee have left their mark on Coghlan and Villa Urquiza – two of the premier districts for street art in the city. Sponsored by the organization Buenos Aires Street Art, Coghlan and Villa Urquiza have more than 50 murals between them. 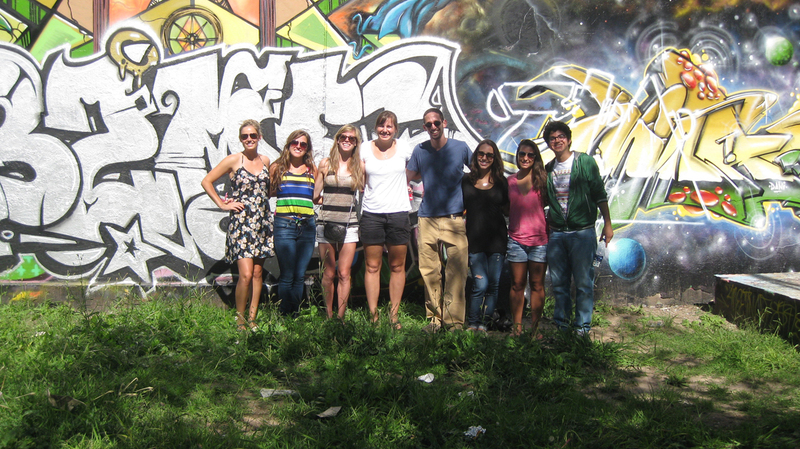 When you study abroad in Buenos Aires, discover why this Argentine city was chosen as one of the first locations for The Google Street Art Project, attend one of their international street art festivals, or join IES Abroad Buenos Aires on a graffiti tour with the company Graffitimundo to explore the Palermo, Chacarita, and Colegiales neighborhoods. 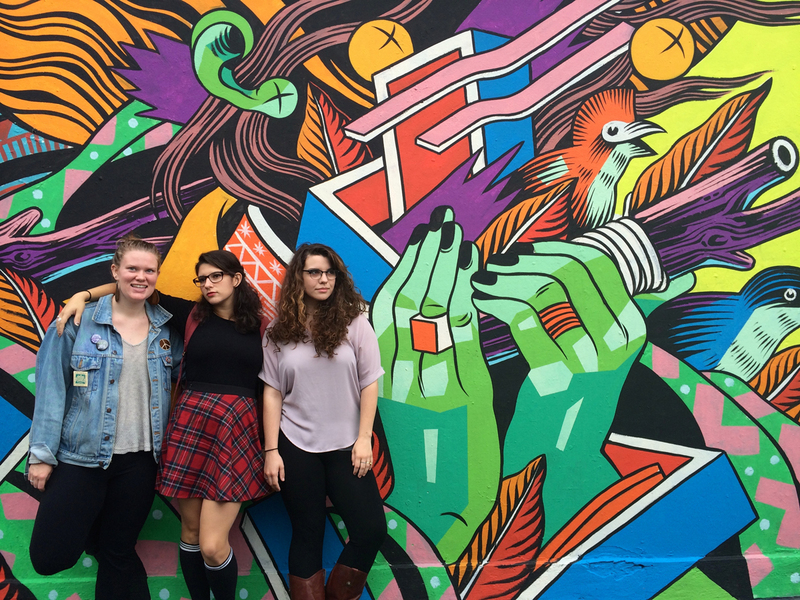 When you study abroad in Dublin, immerse yourself in the growing arts scene where businesses, arts organizations, and even the Dublin City Council are sponsoring artists and commissioning street art pieces around the city. 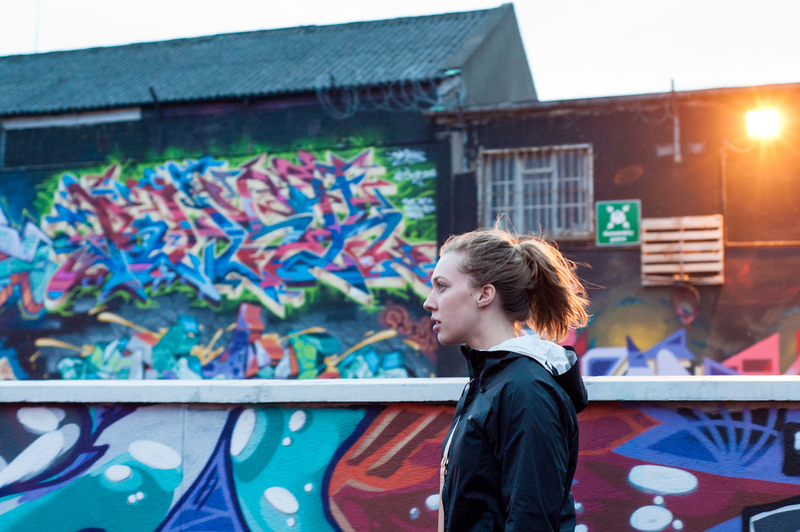 You can find works by famous street artists likes Maser and Conor Harrington in the Temple Bar Neighborhood – Dublin’s cultural hotspot and nightlife center. For a less touristy trek, walk down the narrow graffiti-filled Liberty Lane, which boasts some of the best street art in central Dublin. End your art-filled expedition at The Bernard Shaw – a famously quirky and hip pub covered with street art. Check out its outdoor art gallery, complete with a painted, double-decker bus-turned-food-truck you can sit on while enjoying a slice of pizza. Your days will be filled with more than just tapas and sunsets over the Alhambra when you study abroad in Granada. Stroll through the southern Spanish city to discover its surrealist street art scene. Inspired by Andalusian cultural traditions, playful and thoughtful street art is found predominately in Granada’s Realejo neighborhood. By far the most famous street artist in Granada is Raul Ruiz, better known as El Niño de las Pinturas, who commonly combines images with words and poetry. Before you leave Granada, make sure to wander through Placeta Joe Strummer, a small plaza near the Alhambra to take a look at El Niño’s portrait of the famed 1980s guitarist. Whatever small street you find yourself on, you’re bound to find a hidden artistic gem right around the corner. Don’t take our word for it! 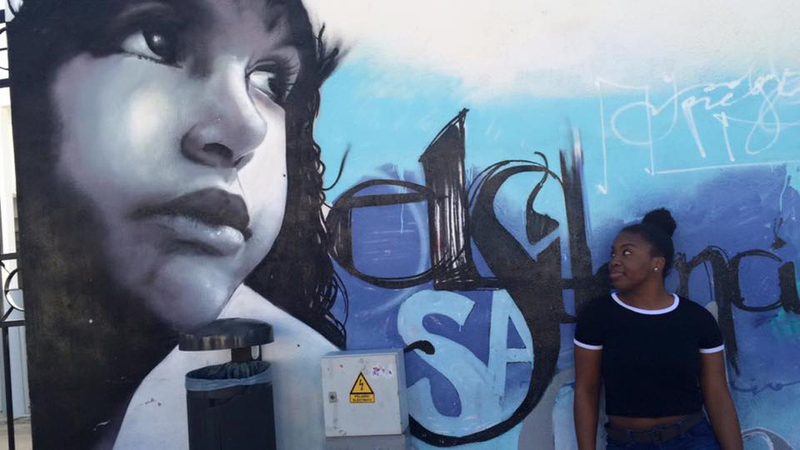 Hear from IES Abroad Creative Correspondent Noah Heil as he reflects on his favorite pieces of street art in Granada. Hong Kong is an international city known for more than business and finance. In the past two decades, the bustling city has emerged as a hub for street art, attracting artists from around the world to visit – and many to stay, such as Portuguese artist Vhils. During a Hong Kong summer internship with IES Internships, you can explore the colorful side streets off of historic Hollywood Road, buy an original piece from up-and-coming Hong Kong street artists at Art Supermarket, and see the newest work from the HKWalls street art festival, which transforms the buildings of a different Hong Kong neighborhood each year. 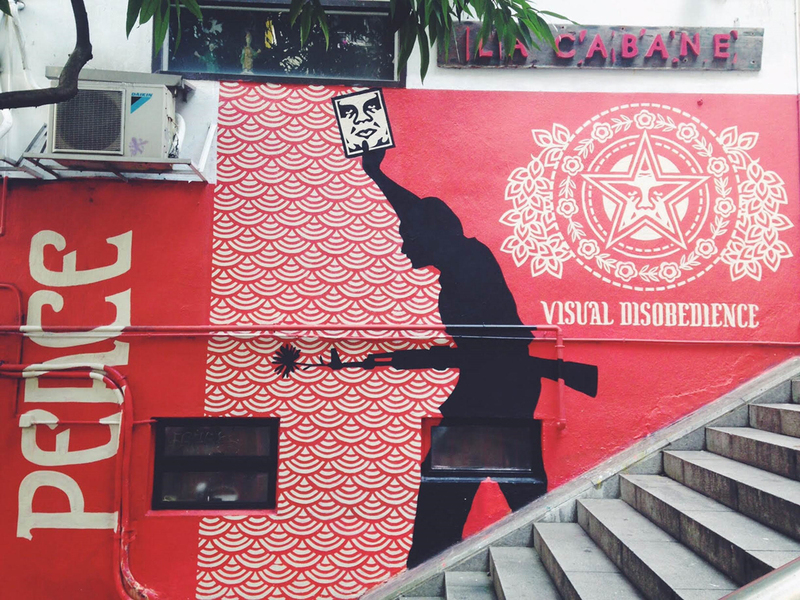 After an exciting day in the office, unwind with a stroll around Hong Kong Island while searching for pieces by Shepard Fairey, who is famous for designing the “Hope” poster for Barack Obama’s 2008 presidential campaign. With one of the biggest scenes in the world for both English and international artists, studying abroad in London means you will run across amazing street art on your daily commute. Keep your eyes peeled for one of the best-known names in street art, Banksy, who has been painting London’s streets and storefronts for more than 10 years. You can find Banksy’s famous French Maid piece along Brick Lane, where London street art is said to have been born. During the summer, Brick Lane hosts hundreds of international artists for an unconventional art fair that’s too fun to miss. Take a street art tour through Camden Town where the world-famous market is surrounded by hundreds of colorful paintings including works by Bambi. If you study abroad on our Study London Program, you could even call this neighborhood home as it’s one of the many IES Abroad housing options. Throughout the city, street art adorns businesses, sidewalks, and metro stations; and it has found its way into galleries dedicated to street art. 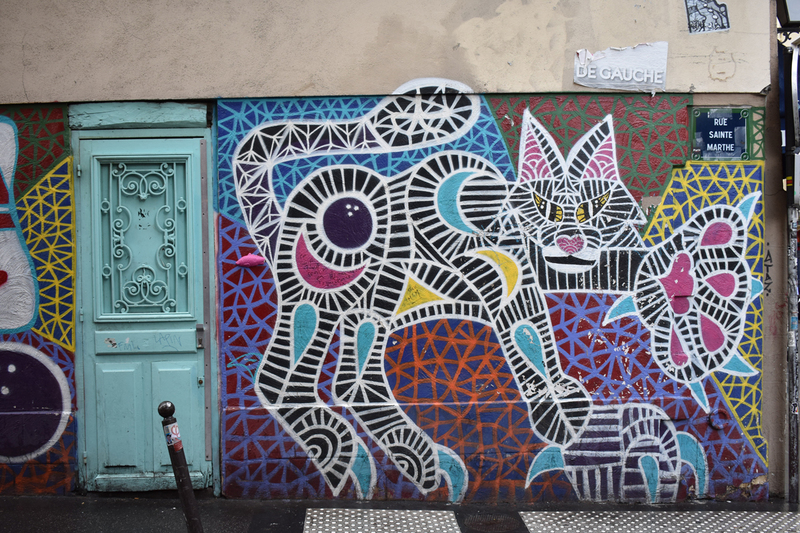 Join IES Abroad Paris on a street art walking tour of Belleville, a neighborhood with so much art, it’s basically an open-air museum. After studying for class or working at your internship in Paris, roam through the 13th Arrondissement to take in the large fresco murals by artists such as Shepard Fairey, SpY, Faile, and Pimax. While the historic “Golden City” in northwestern Spain is known for its sandstone architecture, a thriving modern street art scene exists alongside the 16th century buildings. 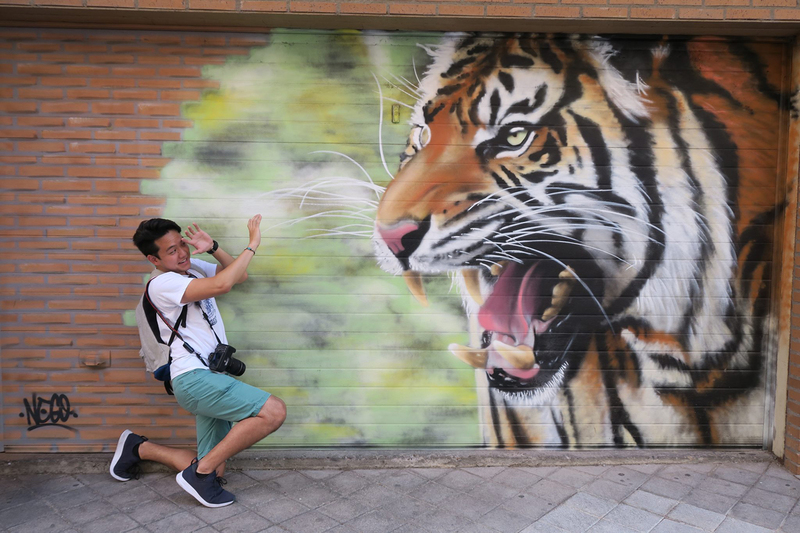 Make your way to Plaza Del Oeste – the center of all things street art – when you study abroad in Salamanca. As you follow the streets that radiate out from the Plaza into the rest of Barrio del Oeste, you’ll see artworks ranging from a hyper-realistic portrait of a tiger to psychedelic and surrealist images reminiscent of Dr. Seuss. Even the trees in the Plaza are decorated with colorful knit sweaters. Learn even more about the iconic street art neighborhood on a walking tour of Barrio del Oeste with IES Abroad Salamanca. Studying abroad in Chile just got more colorful. Home to notable urban artists such as INTI, Mambo, and Sofrenia, Santiago is rich in street art. Be sure to add the Bellavista neighborhood – most famous for street art – to your must-see list. You won’t need a map to point you to the colorful murals in this bohemian, hip area, as art sprawls across walls, sidewalks, and benches. While you’re at it, check out Museo a Cielo Abierto – an open-air museum of 40 large murals covering multiple city blocks and two other popular neighborhoods for street art: Brasil and Lastarria. Continue your street art viewing expedition with a trip to coastal Valparaíso – one of the field trips offered by IES Abroad Santiago. Just about every inch of this culturally-rich port city is covered in colorful, creative street art. Join a street art tour or plan to visit during the Cerro Polanco neighborhood’s graffiti festival. When you think about studying abroad in Australia, your mind might go instantly to remote beaches, lush rainforests, and scenic mountains. 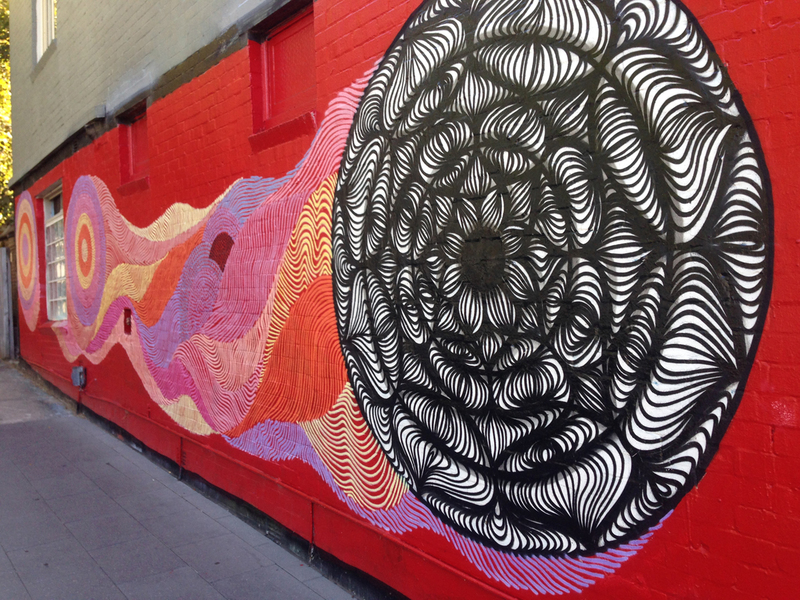 However, the bustling capital of New South Wales is a prime city for scoping out street art. The Sydney street art scene is known for its surrealist and whimsical style though there’s also a strong representation of politically-themed works. Seek out original pieces by Fintan Magee (named “The Australian Banksy” by some), Luke Cornish (aka ELK), and Mulga; wander through numerous street art galleries; and walk down King Lane in the Newtown neighborhood for the highest concentration of street art in the city when you study abroad in Sydney. As one of the most famous beaches in the world, Bondi Beach, is not to be missed. Walk along the Bondi Sea Wall to find surf- and skate-themed street art – many pieces contributed by Mulga. Vienna is most famous for its historic architecture and producing some of the foremost Western musical and artistic geniuses: Mozart, Haydn, Beethoven, Klimt, and Schiele. However, a burgeoning street art scene is sure to impress urban art enthusiasts when they study abroad in Vienna. Walk along the Donaukanal (Danube Canal) between Schwedenplatz and Schottenring for colorful, modern paintings mixed with historic, conservative architecture. On your way to the Museumsquartier, an area with multiple art museums and contemporary art exhibit spaces, take the Street Art Passage bridge that showcases French urban artists Invader’s permanent tile work. We know that there are so many aspects to think about when choosing where to study abroad. Whether you’re interested in fashion, music, hiking, or more, we’ll help you discover the best places to study abroad based on your hobbies and interests.